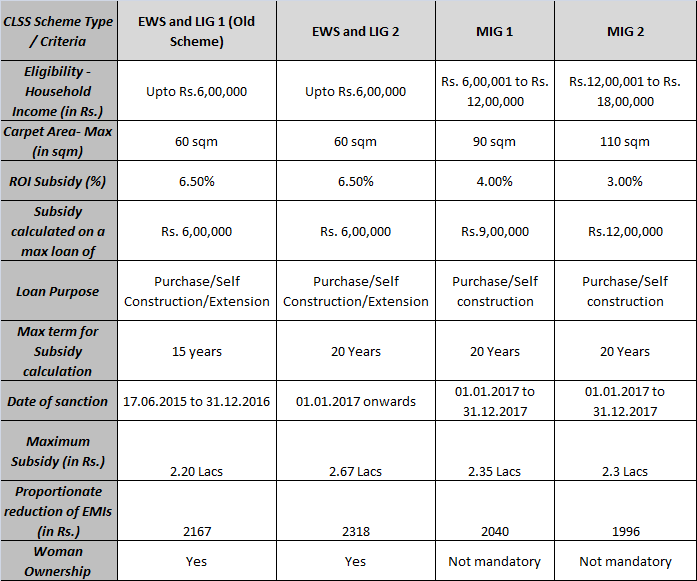 What is Pradhan Mantri Awas Yojna’s (PMAY) Credit Linked Subsidy Scheme (CLSS)? Credit Linked Subsidy, is a scheme launched by our honourable Prime Minister Shri Narendra Modi, for Economically Weaker Section (EWS) and Low Income Group (LIG). The beneficiary would be eligible for interest subsidy on purchase/construction of a house. The scheme is also available for enhancement of a dwelling unit. How will I receive the interest subsidy benefit? The bank will claim subsidy benefit for eligible borrowers from National Housing Bank (NHB). The NHB will conduct a due diligence to exclude claims where customer has submitted multiple request. For all eligible borrowers, the subsidy amount would be paid to the Bank. Once the bank receives the interest subsidy, it will be credited upfront to the Loan Account. Where can I apply for Credit Linked Subsidy Scheme? You can directly inquire and apply for CLSS at the Bank from where you are taking the loan. What are the basic documents required to avail this subsidy? Your income proof / ITR documents will be required. Customers not having income proof would require to submit an Affidavit. Declaration of not owning a pucca house. Further documents shall be required as per the guidelines of PLI. Is there a loan amount limit on this scheme? No, there is no loan amount limit under this scheme. I have a small business, can I avail Home loam under this scheme? Yes, you can avail this facility, if you qualify for the income criteria defined under this scheme. * Please note that we are a privately held development company, and we do not have tie-ups with any of Central Govt. or State Govt.’s nodal agencies to promote PMAY. Also, we do not offer any Govt. scheme linked subsidies, directly to it’s beneficiaries. River Residency management is not responsible for any changes in the PMAY by laws. By spreading the above communication, we aim to provide information regarding PMAY to it’s prospective beneficiaries, and to serve the society. Also, at “River Residency”, the benefits of PMAY can be enjoyed only by beneficiaries who qualify under PMAY criterion defined by the Government of India. For more information on PMAY please visit the website mhupa.gov.in.